Huh, an actual review rather than news. I should probably do more of these. 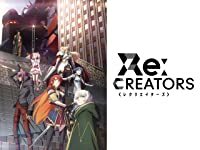 In any event, one of the best shows of this past year, Re:Creators, is now the subject of this review. Not only is it one of the best, but perhaps one of the most original and refreshing as well, in many ways. I'd be heavily surprised if this one doesn't go down as one of the all time classics of anime, but why listen to me ramble here? Check out the review, you won't be disappointed. "I know. It’s all wrong. By rights we shouldn’t even be here. But we are. It’s like in the great stories, Mr. Frodo. The ones that really mattered. Full of darkness and danger they were. And sometimes you didn’t want to know the end. Because how could the end be happy. How could the world go back to the way it was when so much bad had happened. But in the end, it’s only a passing thing, this shadow. Even darkness must pass. A new day will come. And when the sun shines it will shine out the clearer. Those were the stories that stayed with you. That meant something. Even if you were too small to understand why. But I think, Mr. Frodo, I do understand. I know now. Folk in those stories had lots of chances of turning back only they didn’t. Because they were holding on to something." "What are we holding on to, Sam?" "That there’s some good in this world, Mr. Frodo. And it’s worth fighting for."